Leticia Spence says she’s disappointed when designers resort to using general symbols or motifs, like a feather or a circle with four points, to represent Indigenous cultures. 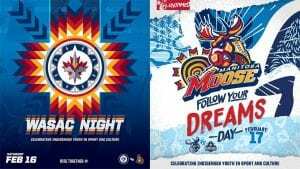 Which is why Spence, a Graphic Design student at Red River College, wanted to take a more authentic approach when collaborating with True North Sports + Entertainment (TNSE) on versions of the Winnipeg Jets and Manitoba Moose logos to celebrate Indigenous culture. She made a point of doing research, reviewing artifacts, learning from modern Indigenous artists and asking members of her own family and community, Pimicikamak First Nation, for help when she started the design process. 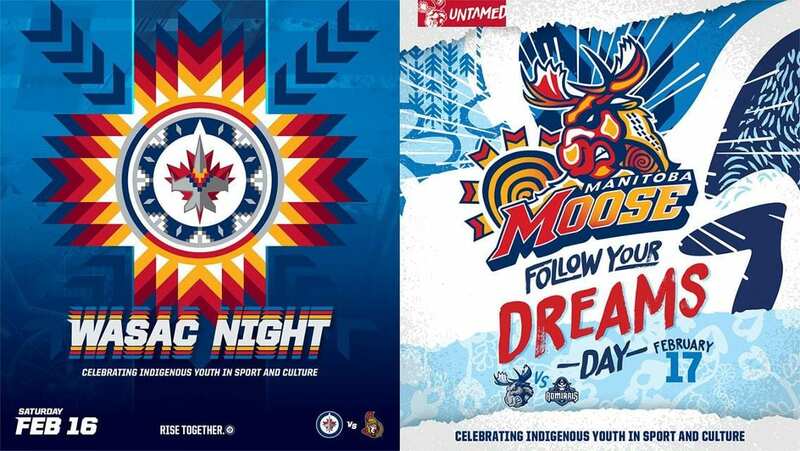 The logos are being used to promote two special hockey games: the Winnipeg Jets WASAC (Winnipeg Aboriginal Sport Achievement Centre) Night on Sat., Feb. 16, and the Manitoba Moose Follow Your Dreams Day on Sun., Feb. 17. Josh Dudych, creative director for TNSE, says Spence helped them create a fully branded program with WASAC, including they weren’t sure what to do for the theme nights in partnership with WASAC, but in working with Spence, were able to create a full branding program that would get fans excited and show their respect for Indigenous culture. “Through Leticia’s expertise we gained a much better understanding of how nuanced Indigenous art is, and how we can use it to celebrate Indigenous communities and engage with them,” says Dudych. Spence came up with the concepts and designed the initial drafts, then worked with TNSE’s design team in their offices to complete the project. “The majority of their team are RRC grads, so it was nice to be able to get advice for my future going forward,” she says. 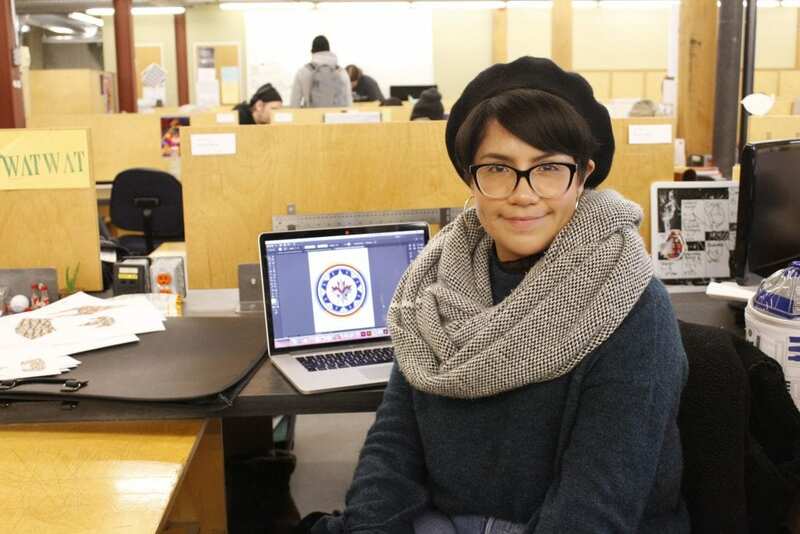 Spence will soon finish her second year of the Graphic Design program, and says her instructors have imparted a lot of beneficial knowledge that she’s applied in her designs, and will take with her into the industry. She says the program demands determination and imposes structure, which is something she didn’t experience before coming to RRC. Chief says Spence is a role model and ambassador and is showing Indigenous youth what is possible when you work hard and have a willingness to learn. When he first saw the logos, Chief says his initial reaction was amazement and pride. Spence included elements of her Cree heritage in the logos, and says the project gave her a chance to use her skills to contribute something to her community, which is important to her. She’s worked with WASAC in the past, and has a long-term goal to engage Indigenous youth from remote communities in creative pursuits. “I would have loved more opportunities to be creative growing up,” she says. Fans can purchase T-shirts with each logo at both games on Feb. 16 and 17, with proceeds going to WASAC.